I created an Algebra card game that plays somewhat similar to the game Sequence. Students take the role of explorers trying to settle a new land. 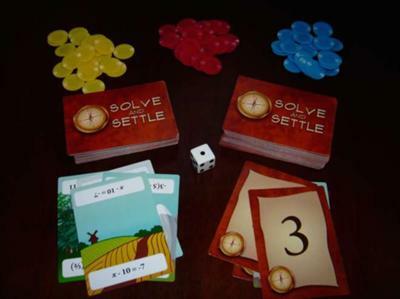 Players must solve simple Algebraic equations in order to settle certain properties. I have created an entry for it at The Board Game Geek website (it's just a database of nearly every game ever created...and not a commercial website) if you want more information. Although I do have it available for purchase from the Print-on-Demand company The Game Crafter, I explain on the site BoardGameGeek that I will send anyone the files for free if they want to print out the cards themselves. I know this was created a few years ago but is there any way I could get it emailed to me so I can print it? this would be a great game for my summer program! Thank you! I would love the documents to self-print the game. TIA! I apologize for those who have asked for the files to the cards so that they could play the game but I have not looked at the comments section of this site for quite some time. I have had several requests for these files so I have placed them online. And click on "FinalCards.zip" to get the files for free and print them out yourself. Jason, I would love the files to print. I am unexpectedly teaching a math class to 7th grade algebra students. This sounds FUN!